Yes, you heard it right Otaku cosplay warrior Yuichiro Nagashima was crushed by Dutchman Albert Kraus. In a stunning defeat the Dutchman combo-ed our hero in a flurry of punches, before leaving our broken hero defeated. Yuichiro although losing to the more experienced Albert Kraus has vow to train harder. From watching the fight on youtube and a quick wiki of Kraus’s history of fights it was fairly obvious that Yuichiro doomed to fail. Kraus’s experience, fight record of 58 wins, 13 losses, 3 draws and seven titles truely shows that the odds were stacked very much in Kraus’s favor. You can check out the smashing fight below. News Sourced From Sankaku Complex. 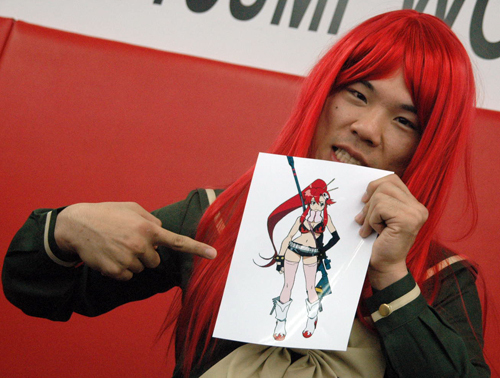 News just in a couple of hours ago, Yuichiro Nagashima plans to cosplay Shana from Shakugan no Shana. For those who are not familiar with Yuichiro Nagashima; he is a kickboxer but not any old kickboxer he’s a Cosplay Kickboxer, yes you heard right he’s a cosplay kickboxer. And this him he’s back with to beat Albert “The Hurricane” Kraus who threatens to take Yuichiro’s Shana cosplay with him if he wins.